The goal for this app was to allow business traveler's an effective way to communicate while travel in groups, or alone. I did the research and interactions patterns for this app. Our Team was a highly independent and self-motivated group of designers. This allowed me to primarily focus on the Research and Interaction design. I created the questionnaire that our design team used to conduct interviews. I spoke with five business travelers who gave us insight into what they have experienced when traveling for business. Above are a few of the answers from user interviews that influenced our design the most. While recruiting for user interviews, I had some issues finding users that traveled for business in groups. I was able to build momentum with finding people to interview with survey results. I created the questions for the survey as well. This allows us to see if there was a demand for a group travel app or if single business travelers needed to be addressed more. I found the trend is towards single business travelers who often will meet up with colleagues when they arrive, but mostly travel on their own. I created these personas based on user interviews, the information I collected from the surveys, and external research. 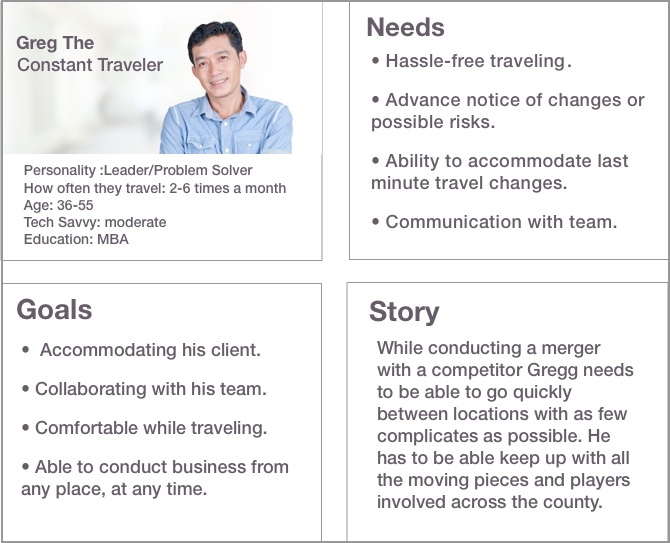 These personas guided the direction of the project. After I brought all of our research together, I created the user journey with input from my teammates. I combined the Personas, Scenarios and the User Flow to create the User Journey. This User Journey maps out the primary user paths we focused on building out for this project. This interaction pattern came out of user research, one of the interviewees told me a story about one time he wasn't able to reach the hotel while flying to let them know of a delay and his room was sold to someone else. This fit with our Persona, Greg. He is looking for new ways to communicate more efficiently using technology. This provides easy access to contact the hotel letting them know you are: running late, want to cancel your reservation or just them a call. This button is most easily accessible on the lower right-hand side of the screen allowing for user freedom. The button icons for the main navigation bar were not all the same design and didn't express their functionality as well as they could. I decided to just change out the three middle icons and keep the other two as they all fit the flat design we had decided on. Go back to nounproject.com found these options which the design and made function clearer. 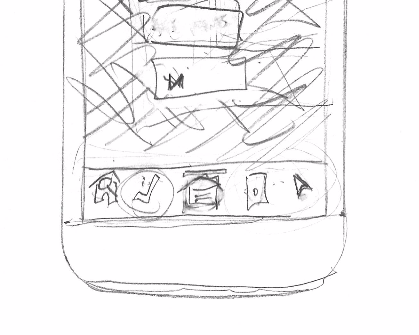 The best results were with in-person testing using the InVision app. The user's used the app more naturally, and they seemed to relate the scenarios easier this way too. 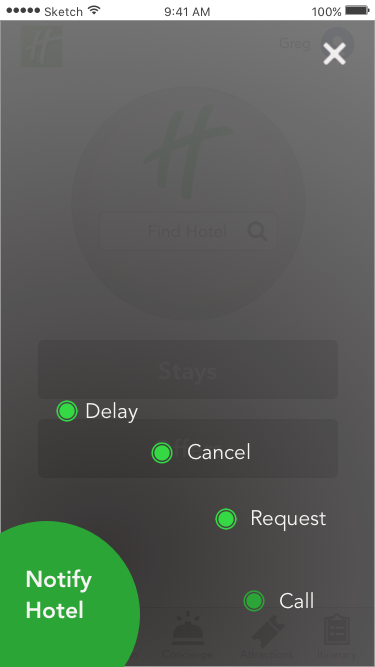 The language for the Notify Hotel button should be changed to say Contact Hotel, as users were confused by the wording. A few of the features I would like to also add into this design at a later time include an interface to find Public Transportation, to build out Request a Service and the Past Stays options. This features would help round out the apps experience for users.